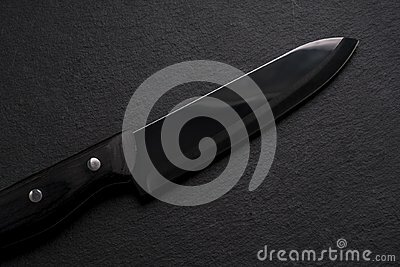 High quality close up photo of a kitchen knife made of black ceramics: shiny and smooth glassy surface of blade, razor sharp edge, dark wooden handle with metal rivets; black shale background with rough surface. Quite stylish and brutal picture. True colors and effective composition, good sharpness and large size of the image. Fits for different purposes and topics: design, kitchen tools, cooking, making food, chopping something, natural materials, etc. Ceramic rose background. Cube decorative white elements. Color pens in a ceramic cup. Pre inca ceramic called `Huacos` from Chancay Peruvian culture.